Oracle and Salesforce.com are teaming up in a nine year strategic partnership to pull together applications, platform and infrastructure on the cloud. The deal brings together Oracle's software with Salesforce.com's customer relationship management system and marks the former's attempts to build alliances with companies previously considered as rivals. Under the agreement, Salesforce.com will standardise on the Oracle Linux operating system, Exadata engineered systems, the Oracle Database and Java Middleware Platform. Oracle will integrate its Fusion HR and financial cloud with Salesforce.com, and provide the core technology to power the latter's applications and platform. Salesforce.com will also implement Fusion throughout the company. 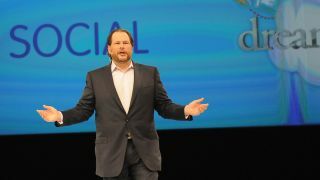 Mark Benioff, Chairman and CEO of Salesforce.com said the companies agreed on the need to integrate their clouds, and that the move would combine the simplicity of its system with the power of Oracle's software. It's the second big announcement on successive days for Oracle, following the agreement with Microsoft to run its software on the Windows Server Hyper-V virtualisation platform and Windows Azure cloud platform.